Yesterday was the last of my fashion week shows. I went to checkout Adrienne Landau who had some Aaaaaamazing furs. 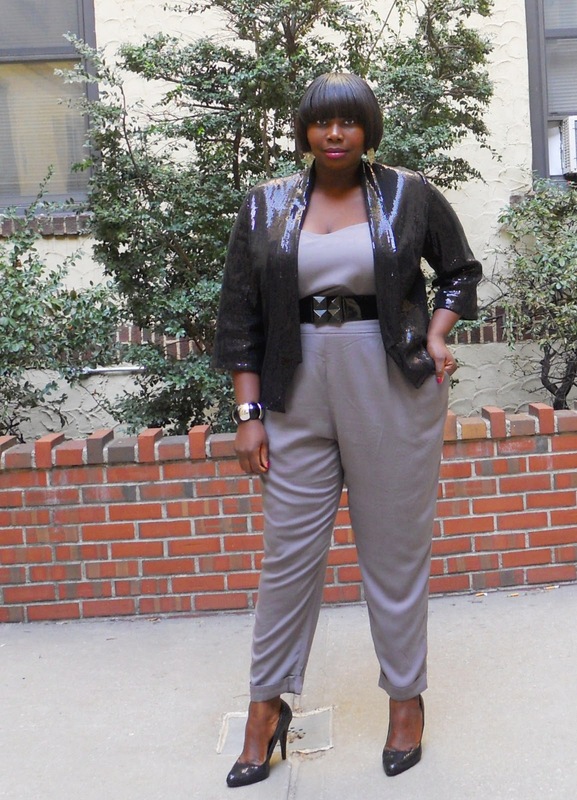 The weather was so mild yesterday that I decided to wear my gray strapless jumpsuit that I scored from ASOS. I haven’t finished tweaking this jumpsuit yet. It is a little big and I need to get it taken in. I haven’t had a chance to hit up my tailor so he could make it perfect, but, that didn’t stop me from wearing it anyway. 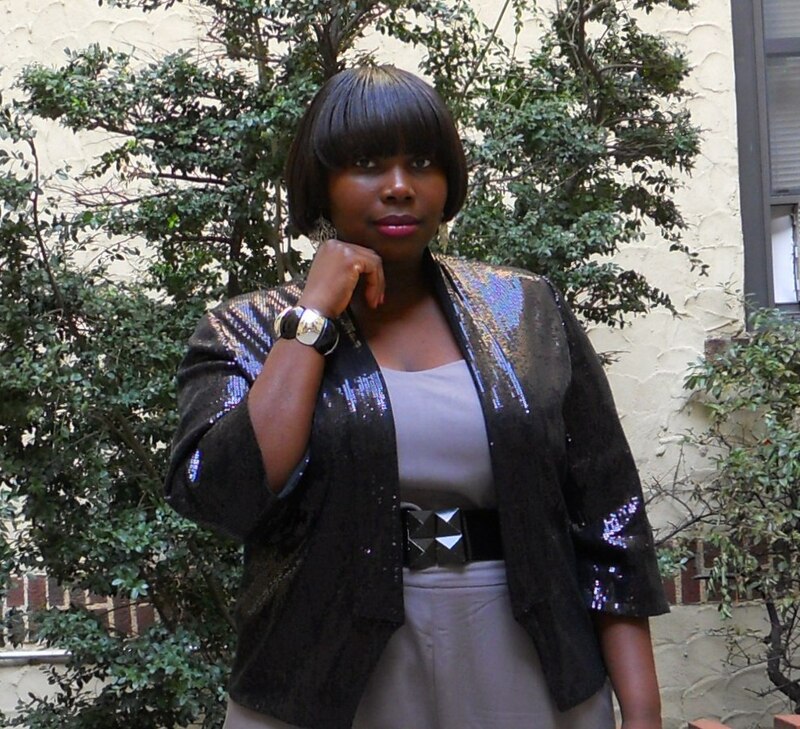 I wore my sequin waiter jacket (yes, again) from Nordstroms Sejour line with it to add a little glamour to my look. When it came to accessorizing I kept things minimal because I realized the lack of silver jewelry I have. All my accessories are gold. However, I did manage to find in my jewelry draw a black and silver bracelet, so I threw that on. 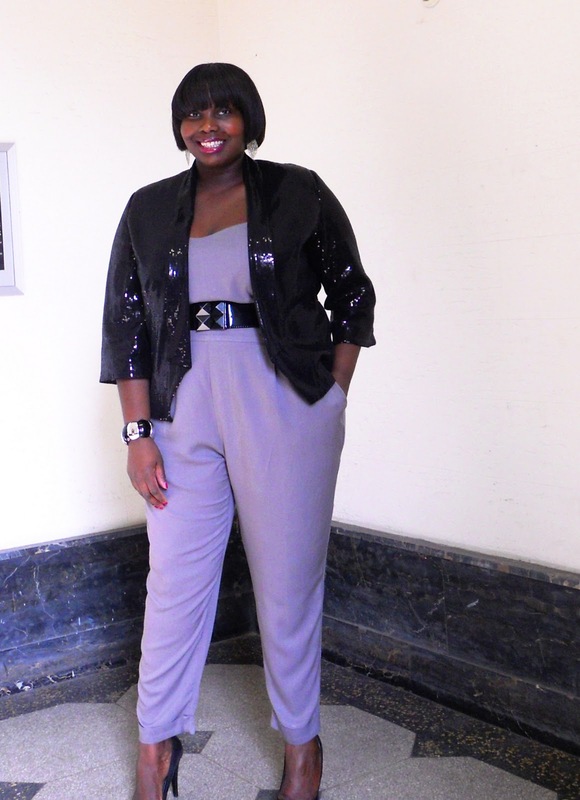 I was excited to finally wear my black sequin pumps that I got on Ebay. 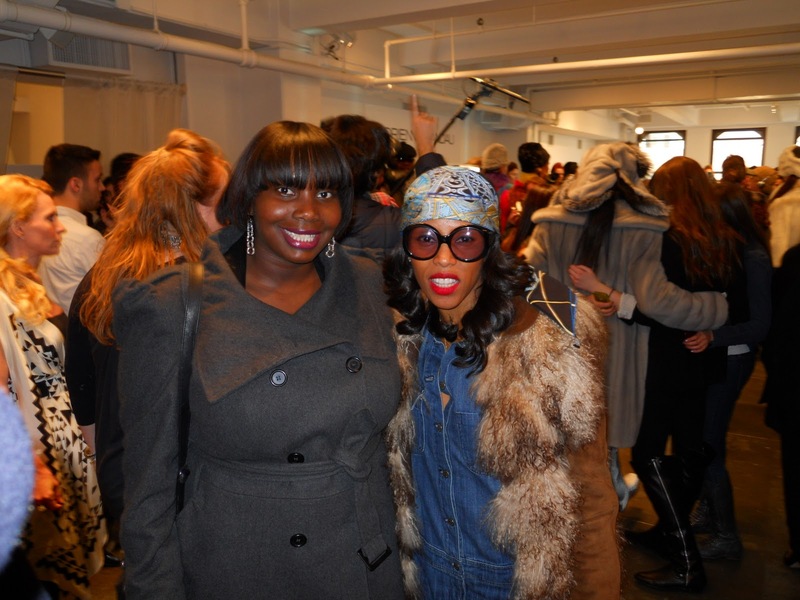 While checking out the luxurious furs at Adrienne Landau I ran into one of my fave stylists June Ambrose and she was nice enough to take a picture with me after I stopped acting like a groupie. This weekend, I will be busy writing reviews of the shows I attended and enjoying the mild weather that we are supposed to be having. This year fashion week has been crazy. Yesterday I checked out the Boy Meets Girl show at the Metropolitan Pavilion. I had to take my outfit pics in the morning because I didn’t want to lug my tripod around with me and sometimes asking random people to take your photo is a bit awkward, especially when they give you a little attitude or they just take a crappy photo. 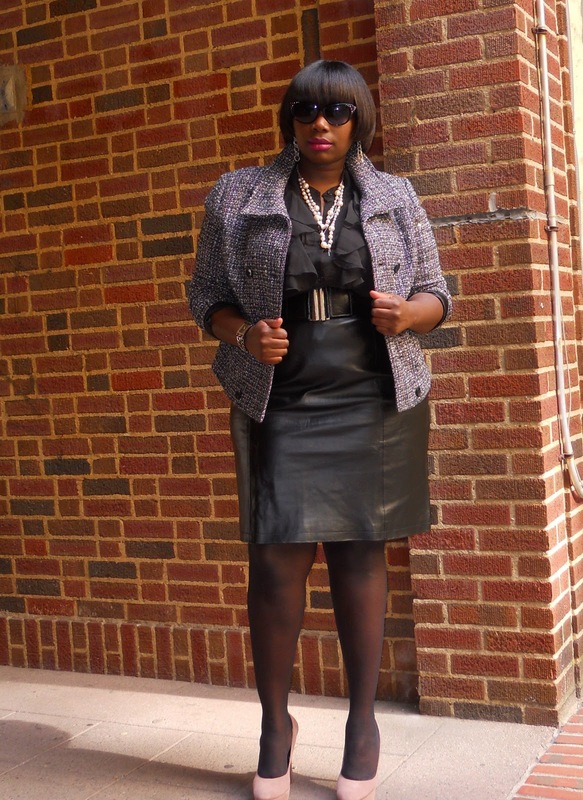 I wanted my look to say magazine editor. I feel like when magazine editors sit front row at fashion week they always wear black and they rock a cool jacket for a chic look. They also almost always have on a pair of super high heels. So, that’s the look I went for. 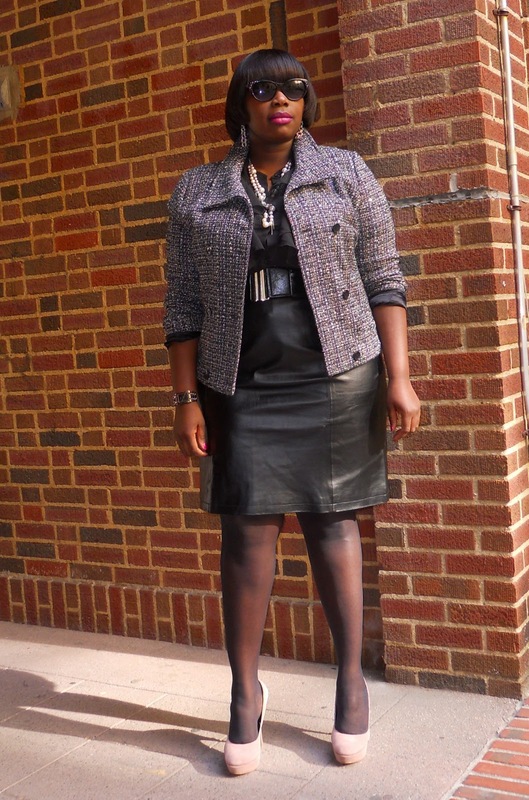 I’m wearing my tweed jacket from the GAP (which is still available) and my absolute favorite skirt of the moment, a leather skirt that was gifted to me from Jessica London (yes, you heard right. 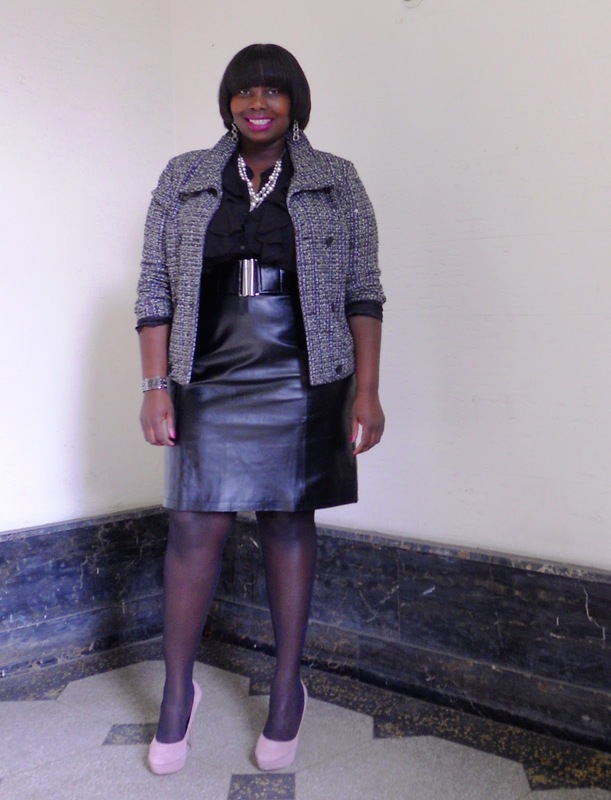 And you will see more of this skirt) which is still available, a sheer ruffled front blouse from Norma Kamali at Walmart, and my score of the month, a pair of Steve Madden suede blush pumps that I got at Century 21 for $17.49 . 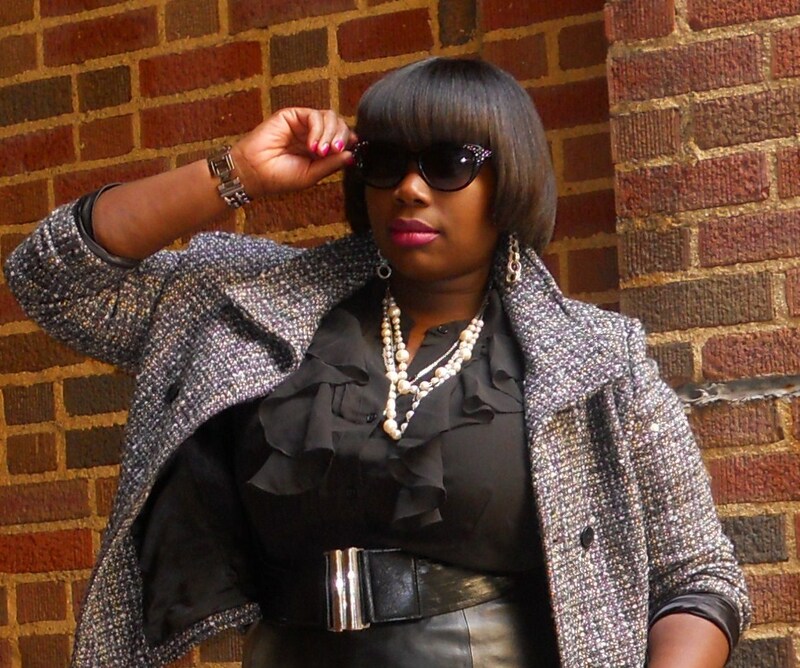 My shades are from Forever21, watch from Guess (I love big man watches), and pearl necklace from American Eagle (gifted). Check back this week for reviews on Boy Meets Girl, Farah Agsana, and Joy Cioci. The precursor to fashion week is the Heart Truth Red Dress Collection where popular celebrities all don a red dress from today’s hottest designers. SC had a seat at the show and I must say it was so much fun. There were many surprises, like seeing Laila Ali come out with her pregnant belly, Suzanne Somers twirl down the catwalk, and Ms. Patti La Belle that made the crowd go wild. 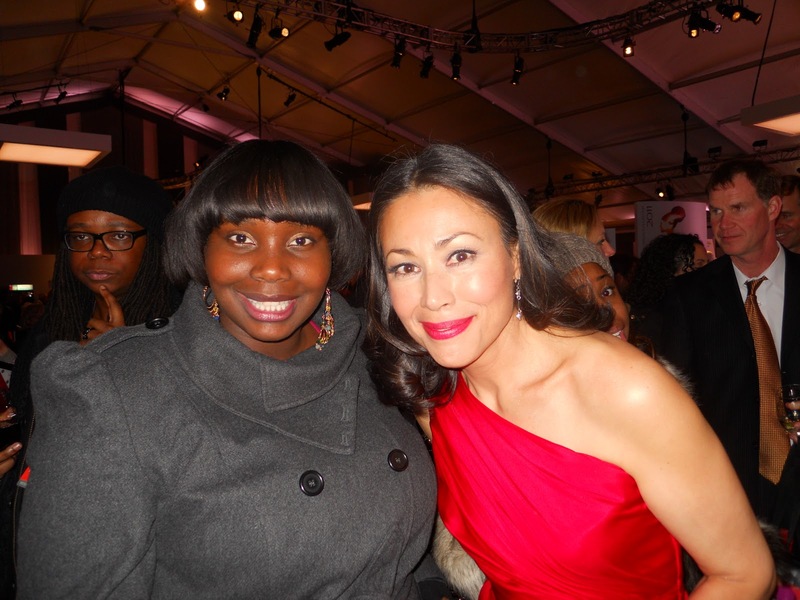 The red dresses were gorgeous from designers like, Donna Karan, A pea in the pod, Zac Posen, and Nicole Miller. 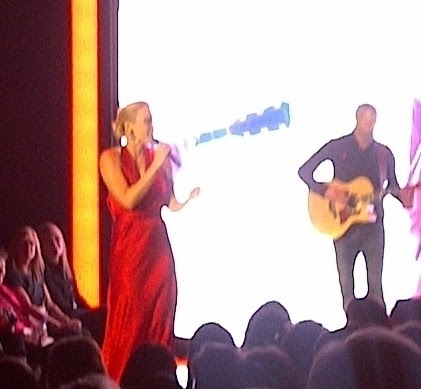 We were also serenaded by a beautiful Natasha Bedingfield. 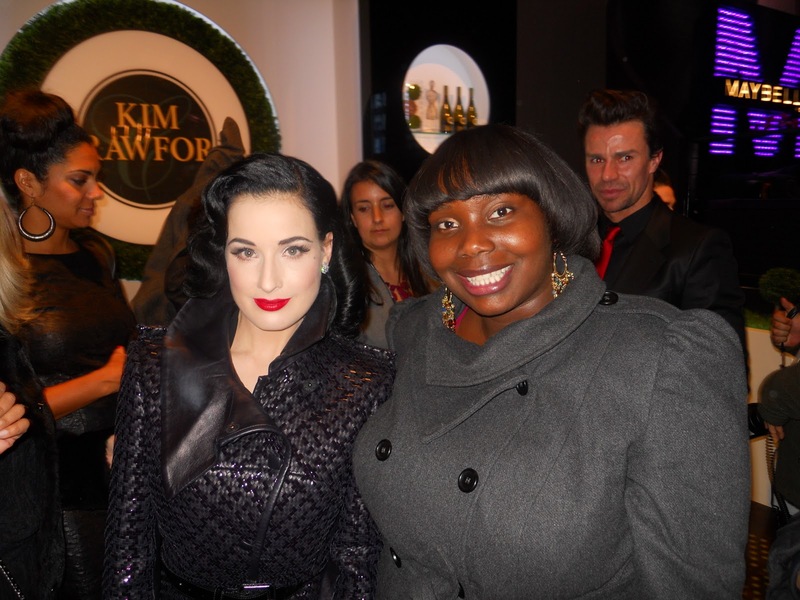 And Dita Von Teese who were both very nice.